Uncharted 2: Among Thieves was an immediate game-changer when Naughty Dog released it in 2009. As a high octane love letter to Indiana Jones and the 1950s adventure serials that inspired it, it set an ideal expectation for the adventure genre — never give the player an opportunity to breathe. Every objective must serve the plot, every visual must impress. Every gunfight must be organic and unique to its setting, and spring from the context of the narrative, rather than simply exist for its own sake. Yes, Uncharted 2 is a classic game, no doubt about it. The museum level is a tutorial, ostensibly. It's the first proper level in the game, and it suffers from an excessive amount of handholding. At times, the action will even freeze, and you must perform the correct movements in order to unfreeze. If you take too long deciding what to do — like finding an alarm — or if you decide to explore the area and go 'off the rails' — like looking for secret treasure — the game itself or the side characters will tell you, explicitly, what to do next. There's no trust in the player's ability to figure things out for him or herself. Sometimes, these hints are optional — you need to press the control pad in order to see the solution — but unless you press the control pad, the game will display 'HINT' in the lower left hand corner. The message is clear — stay focused on the task at hand, and don't screw around. The puzzle rooms you'll find much later in the gamemake for a better, legitimate struggle. You arrange symbols in the proper order to raise a pedestal, or you turn a massive key to open the mouth of a massive statue. There are no enemies and no hazardous obstacles; the puzzle sequences play out in relative silence (with minimal hints), but they're compelling unto themselves — it's a bit more involved than 'pull that switch to open that door.' In one particularly memorable puzzle, you must arrange a series of mirrors to reflect light onto statues. The game gives you complete, free-range control over these mirrors. It's a small touch, but it allows us to feel more invested and autonomous — that we're participating in a puzzle that is more than a glorified QTE. You can't beat that bright, clear scenery either. The size contrast is just unreal — you get a sense of vertigo when you're balancing on ledges. Somewhere between dangling on a massive face and climbing a massive dagger, the imagination runs wild. Who built this? How much time did it take? How many men died doing so? J.K. Rowling once remarked that the job of an author is to know everything — to build an entire living, breathing world, and then show us a tiny portion of that world through the lens of a single story. Setpieces like this make us wonder about that world beyond the game, way before Nathan Drake arrived, and that's a testament to Naughty Dog's creative process. None of this is present in the museum tutorial. You spend the first part of the level (not to mention the last part of it) crawling around the tubes of a foul-looking sewer — climbing up and down rusted ladders, and turning off hot steam vents in order to advance. It's narrow and closed in — completely different from the wide, open spaces and dramatic size contrasts that you encounter later on. Even when you get past the sewers and start exploring the museum proper, it's still fairly narrow — narrow hallways, narrow roof pathways — and dark. It's the only level in the game that takes place at night, and thus, everything feels muted and half concealed in shadow, like a mission level in Splinter Cell. It's difficult to appreciate the elaborate visual detail of the palace museum, even in places like the main courtyard area, which are meant to be expansive and impressive. The Uncharted franchise works best when it's 'on location.' Instead of finding a Mongolian artifact in a Turkish museum, why not go to Mongolia itself? Maybe investigate a tomb or a shrine, and find the lamp that way? It would make sense, and be visually exciting. But no: instead of solving ancient puzzles, or disarming ancient booby traps, we have to watch Nathan Drake square off against modern obstacles — sewers, steampipes, hidden cameras, and underpaid security guards — in a dark, unlit area. There's no mystery, no sense of wonder and awe. It's like a scene from a bad heist film got spliced into an otherwise incredible adventure film. It doesn't even work as a tutorial. The point of a tutorial is to teach a player about skills that they will need in the future. But, as Nathan makes clear in the boat ride over to the museum, this is a 'no rough stuff' type of deal. You must reach the lamp through nonviolent means, by shutting off cameras and sneaking past guards. So much emphasis is placed upon stealth that a new player might assume that this is a stealth game. But it isn't, obviously — the game has trained you in a skill that you never really use again. You can sneak about and break a few necks, but most confrontations in the game are forced — you don't have the choice to play it quiet, even if you wanted to. There's no way to distract or manipulate your opponent. In a stealth game, if you make a noise, the enemy will investigate the sound. But in Uncharted 2, if the enemy spots you, you're done. There's no way to run and hide, or circle around, or cause confusion. The game also discourages stealth by mostly giving you nothing but loud weapons. The tranquilizer gun never makes another appearance, and you don't get another silent weapon until you acquire the crossbow late in the game. Thus, it's always easier to shoot the enemies in the face, rather than sneak past them. Stealth, counterintuitively, is the path of most resistance, which defeats its entire purpose. Open combat is where Uncharted 2 shines brightest. Take, for example, the car convoy fight. The stakes are clear: rescue Schäfer, and recover the dagger. These stakes create urgency — greater urgency than if you needed to execute a wave of bad guys because they were, well, bad guys. And lastly, the developers deliberately escalate the gunplay and pyrotechnics over the course of the fight. You go from throwing bad guys out of their vehicles to shooting them to blowing up the cars themselves — capped off, of course, by a rocket launcher shot at the end. It's a perfect example of storytelling and building suspense through action, rather than relying exclusively on words. The other two Uncharted games had much better opening levels. 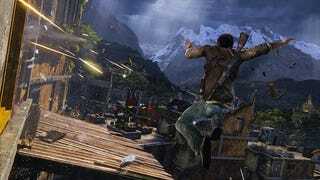 In the first Uncharted, you battle on a boat, where you learn to shoot (at moving targets, no less), and then explore a temple, where you familiarize yourself with platforming and shooting. Uncharted 3's first full level is actually a museum heist, but the crucial difference is in its approach. The focus is less on the stealing of the object, and more on the mayhem that occurs after the heist. The level climaxes with a rooftop chase scene that's both scenic and suspenseful. There's a swashbuckling fun to the whole thing, and it contextualizes the Sully/Nathan, father/son dynamic that drives the game's story. Too often, opening tutorial levels feel disconnected — as though they're a necessary, belabored evil rather than an organic part of the entire game. In Uncharted 2, the real 'tutorial' level is Borneo, which comes immediately after the museum level. It takes place in an open area, for one, but it's also where you learn to fight with an array of weapons — traditional guns and artillery, but also your fists and grenades. You solve both puzzles and platforming challenges. You learn every skill you need to conquer the rest of the game. You do so in an environment that's varied and entertaining. The level is fun, above all. And that's what makes it so effective.